The 2022 Winter Olympics Organizing Committee contracted Beijing Shougang International Engineering (BSIE) to design and construct an office plaza in Shougang, a historic industrial park in Shijingshan District, Beijing, China. The project called for innovative planning due to challenging site conditions and various regulations. Many of the original steel plants were protected, and strict requirements governed the height and architectural style of the buildings being redeveloped. The challenge was to develop an 85,300-square-meter plaza that met the committee’s needs while complying with district regulations. BSIE is accomplishing the owner’s vision by retaining the original structures, repurposing the space and preserving the industrial aesthetics; and BIM processes drove an integrated delivery method. Xishi Winter Olympics Square is part of a demonstration project that’s redeveloping several derelict steel plants for use as winter sports complexes. Located on the northern edge of Old Shougang Industrial Area, the 8-square-kilometer project site is adjacent to high-rise residential buildings and open public spaces. BSIE intended to transform a series of 100-year-old plant silos into a modern office complex that reflected the area’s heritage and created an iconic image for the 2022 Winter Olympics. As the engineering, procurement and construction contractor, BSIE performed site planning, surveying and mapping as well as integrated design and construction, and operation and maintenance planning. The project objective was to develop an energy-efficient design that optimized construction quantities and ensured constructability. At the owner’s request, BSIE planned to create data models for use during all stages of construction, then turn over the data to the owner for use in operation and maintenance. How to develop data that would satisfy the requirements for asset lifecycle information management was a major consideration. The project team needed a full understanding of the site conditions and status of the existing facilities to meet the design requirements and constraints. Given the age of the facilities, the team found that site conditions had changed compared to the original blueprints, and blueprints were unavailable for many areas. In addition, long-dormant areas posed safety risks for surface and subsurface investigations. Incomplete and outdated information made structural analysis of the factory buildings a challenge. BSIE also found that the usual problems associated with a project of this size (e.g., interdiscipline synergy, construction planning and logistics, etc.) posed bigger challenges considering the site’s history. This project demanded innovative technology to overcome the constraints, limitations and risks. 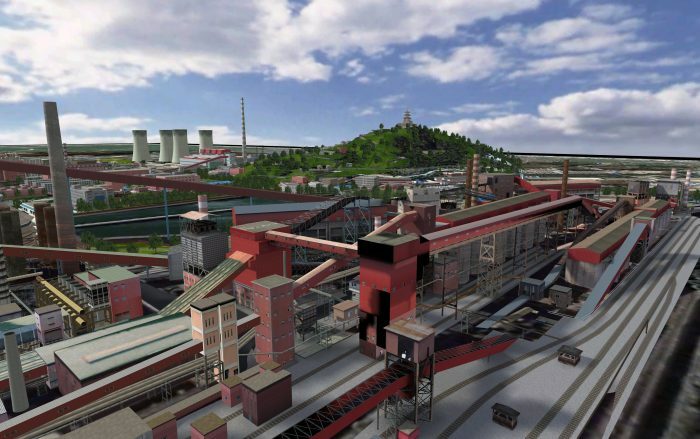 BSIE leveraged Bentley technology to better understand the site and existing infrastructure as well as generate reality models for context. Using 3D laser scanning and modeling powered by Bentley Descartes, the team captured point-cloud data, integrated the data with blueprint information, and then used Pointools to perform a differential analysis of the two datasets. An efficiency analysis using custom mathematical modeling applications provided basic data on the structural strength of the facilities. GIS technology revealed the status of pipelines, and GEOPAK applied surveying and mapping data to simulate the site environment. In compliance with local regulatory requirements for green building projects, the BSIE project team implemented BIM technology at all stages of the project lifecycle. 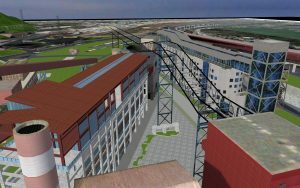 Bentley’s 3D modeling applications (AECOsim Building Designer, ProStructures, OpenPlant, and Bentley Raceway and Cable Management) enabled BIM processes for buildings, structures, pipelines and electrical systems. ProjectWise provided one source of multidimensional data to support collaboration for planning, design, procurement, construction, and operations and maintenance. These BIM processes secured access to data and enabled information mobility, saving production time and costs associated with the corresponding models for various departments. Using 3D laser scanning in lieu of traditional survey techniques allowed BSIE to leverage Pointools as a source of information for decision making and analysis during the latter stages of the project. Point-cloud technology facilitated construction inspections and produced a spatial database of as-built construction, and it saved an estimated CNY 1 million and 3 to 5 percent of the time it would have taken using traditional methods. Bentley’s BIM technology reduced the workload for modeling by roughly 10 percent, cutting costs by nearly CNY 1 million. The savings were especially apparent in the detailed steel structure design, because a unified data format could easily be transferred to Bentley’s detailed structural drawing software. Using the same data format made data exchange among disciplines convenient and reliable, with no data loss. BSIE initiated its BIM process during the design stage and extended it to the end of construction. The team achieved Level 4 BIM implementation, with intelligent models that incorporate fine detail. Throughout the project lifecycle, the BIM workflow was multidimensional and multi-discipline. Having a federated BIM model minimized the time and cost of creating as-builts from scratch. The data model will ultimately be integrated with AssetWise ALIM, Bentley’s asset lifecycle information management system, which can manage change and control information throughout the infrastructure lifecycle. Phase 1 of the Xishi Winter Olympics Square project was completed at a total cost of CNY 3.6 billion (approximately US $542 million). The 2022 Winter Olympics Organizing Committee now occupies the space, which has a finished area of 5,620 square meters. The Old Shougang Industrial Area has since become a demonstration project viewed by hundreds of visitors worldwide. Redevelopment of a defunct industrial facility used fewer resources and caused less environmental impact than a greenfield development of new office space. BSIE’s concrete and steel structure transformed six industrial silos into a multilevel, multifunctional building featuring a restaurant, lecture hall, coffee shops, and other facilities for public and private use. The iconic project won the Asia-Pacific Business Pioneer Award and, with technologies such as solar energy and fiber-optic lighting, rated two stars on China’s Green Building standard. Phases 2 and 3, which include the remaining office and common areas plus transportation links for the site, are in development and due to be completed by the end of 2018. When open to the public, this new landmark in the Shougang area will be ready to receive the 5,000-plus visitors and dignitaries expected on a daily basis leading up to and during the 2022 Winter Olympics. In the meantime, nearby residents can witness the plaza’s ongoing transformation from industrial zone to Olympic locale. Aidan Mercer is a Senior Industry Marketer at Bentley with 6 years’ experience in high-technology environments. Aidan has worked at Bentley Systems since 2010, joining from the Exor, an asset management technology organization. He has held various roles in Geospatial and Utilities and now heads up after industry marketing for Government. He holds a masters in marketing from the University of Gloucestershire and various CIM chartered marketing qualifications. He resides in London, United Kingdom.